Home Media Ltd is one of Kent’s leading premium Hi-Fi, home cinema and custom installation specialist. 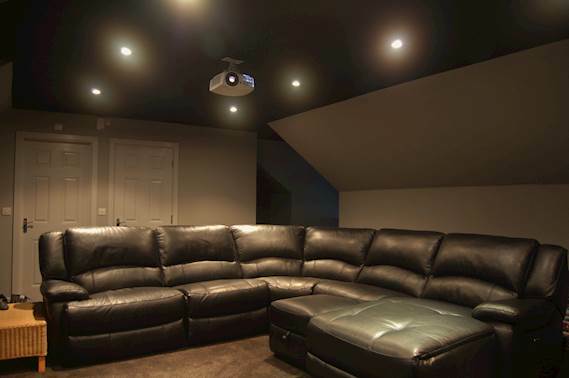 Challenge: Home Media Ltd was appointed to design and install a stylish attic room home cinema system with perfect picture quality. Solution: The Maidstone-based AV experts chose the Optoma HD50 1080p projector with an acoustically transparent Projecta fixed screen, allowing for PMC Wafer 1 in-wall speakers to be mounted inside the framework of the screen. 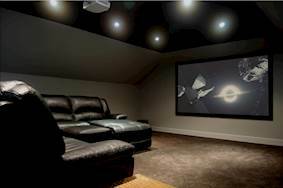 Home Media Ltd was appointed to design and install an attic room home cinema system. The property owner wanted a large image with perfect picture quality to enjoy films and games with his family. The attic space measures 6m x 8m and is an integral part of the house, with its own full size staircase and en-suite. The team needed access above the ceiling to install speaker cables to the mounted rear speakers. The Maidstone-based AV experts chose the Optoma HD50 1080p projector. This Full 3D 1080p has two HDMI inputs, which combined with the 1.5x zoom and vertical lens shift gave real flexibility in installation. The HD50 uses PureMotion frame-interpolation technology. This advanced motion control processing eliminates motion blurring or image judder, even in high-speed action films or fast-paced sports. It is also engineered with a sophisticated colour management system that displays accurate colours and allows the user to fine-tune the colour settings to the Rec. 709 standard for optimal precision. The projector’s Dynamic Black Technology gives added depth to the image by smoothly adjusting the lamp output, based on the brightness information of each frame. This makes bright scenes appear crisp and clear, while dark scenes remain detailed with deep blacks and exceptional light and shade detail. Home Media Ltd specified a Projecta fixed screen with acoustically transparent screen material, allowing for PMC Wafer 1 in-wall speakers to be mounted inside the framework of the screen. Two JL Audio D110 subwoofers were used to provide depth to the soundstage and to underpin the three (LCR) PMC speakers. KEF Ci200QR in-ceiling speakers were installed as rear channel speakers and painted black to blend with the ceiling for a subtle look. Cables were fed into the wall cavity, exiting the wall behind the amplifier. At the heart of the home cinema system is a Yamaha RX-A1050 AV Receiver and Yamaha BD-A1040 Blu-ray Player. A SKY HD satellite receiver and X-Box One complete the system to provide a complete entertainment solution. A programmable touch screen remote control has been configured to enable all family members to operate the system with ease. For example, one button on the colour touch screen is programmed to carry out numerous commands that turn the system on and off. The owner is very happy with the end result but is now regularly subjected to watching the Blu-ray version of Frozen by his young family! Optoma HD50 projector, JL Audio D110 subwoofer, PMC Wafer 1 in wall, PMC Wafer, Projecta screen, SKY HD, X-Box one, Yamaha BD-A1040, Yamaha RX-A1050.